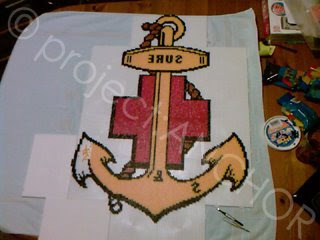 So, it's almost finished except for me having to work out the lettering for the bottom of the anchor. 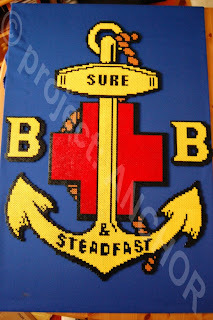 I've got one of the B's done (not shown here) but once again, I've run out of beads (mainly the yellow) and boards (I know it doesn't look it but I'm using the oblong ones here but will need the square ones when it comes to iron it out....yes...just how am I going to iron this? Well actually, it's the second planning error for this project. The first was not having enough boards but then again I don't think I thought that it was going to end up being the size that it is. But that seems to be sorted now cause my extra boards turned up yesterday so it was all go to try and get more of it done, when I hit another problem. 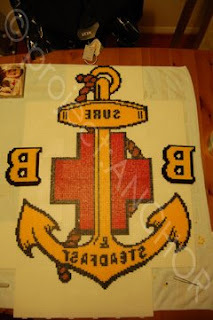 I ran out of black beads! 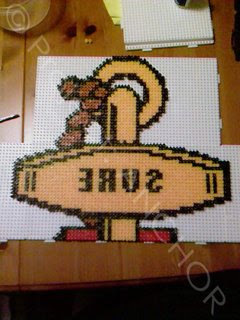 So of course, without the black beads I can't do the outline and therefore losing count of what line I'm on. I was 99.9% certain that I had ordered more when I put the HUGE order in the last time but it turns out that I only ordered the colours that I thought I was going to need for the original image and there was very little black in that. The problem that I now have is that by continuing it today, I've ran out of boards!! So going to have to invest in some pronto in order to get this done....the next hurdle to overcome is what I'm going to do with it once it's completed! 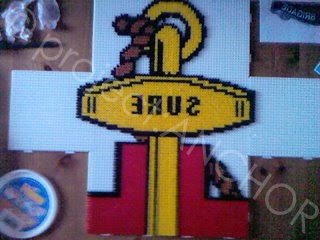 I mean, I know I'm going to iron it but how I'm mounting or framing...that's a different story! Problems, problems and did I say problems? In sadder news, I won’t be able to do the original logo that I intended to do. It’s just proved too difficult for me at the moment so I think that I am just going to go with the older version of the logo and see how that goes. Again, the size thing is causing me concern but hopefully I’ll be able to work something out and these will be done for August.